Snake body is 39" long, total length w/ head is 43"
Those snake charmers are brave, their skills are pretty impressive. If you've ever wanted to try your hand at it but can't seem to come up with the guts than you might want start with this bony little guy. You might see it as cheating since he doesn't seem to have any guts either, but his demeanor still seems pretty intimidating. So get out that flute and basket you've been storing, it's time to pursue your dream. 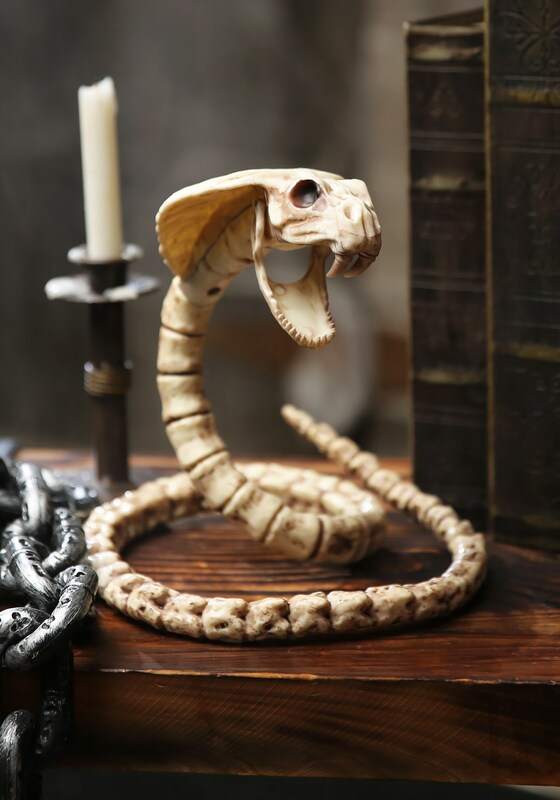 Whatever the plans are for your cobra skeleton, you're sure to get a few shrieks if you put this bad boy out when the trick-or-treaters are heading to your front door. While all of those creepy scales are gone, his reared up head that's ready to lunge is sure to make the skin of any Halloween revelers crawl. Make sure you've got that anti-venom ready when you're playing the flute for this fellow. He's pretty unpredictable, even in the afterlife.